"Alexa, open Veteran's News Hour"
The Veterans News Hour, March 18, 2019 Topics: PTSD and marriage, adapting to civilian life, standing up for yourself, and other topics. The Veterans News Hour, January 7, 2019 with David Cory - Information and News for Veterans and Fans across the country! 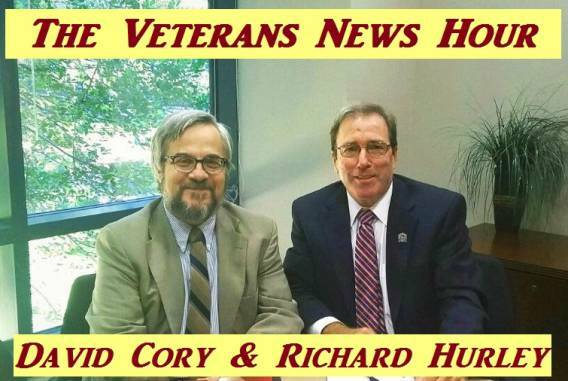 The Veterans News Hour, October 22, 2018 with David Cory, Cost of Living Adjustment Act, Veterans Affairs, Disability Compensation payments for Veterans, etc. Facebook YouTube Cory & Hurley Law Group, P.L. David Cory is a lawyer who represents veterans and military personnel in disability claims and appeals and in adverse personnel actions. He is a graduate of Jesuit High School of Tampa (1977), the University of South Florida (BA, Political Science, 1981) and the University of Florida College of Law (Juris Doctor, 1984). He has been a licensed attorney (State of Florida) since May, 1985. Facebook Twitter LinkedIn Cory & Hurley Law Group, P.L. Richard Hurley became a partner with David C. Cory to form the law firm of Cory and Hurley Law Group in October of 2012. Since that time he has provided legal services for veterans and active military covering a wide range of legal disputes. A majority of these cases focuses on providing VA disability compensation for veterans who served in the United States Military during WWII, Korean War, Vietnam War, Iraqi War, Afghanistan and during times of peace. Richard attended Jesuit High School, Tampa, FL (1977), Florida State University (1981) and Seton Hall Law Center (1984). He was admitted to practice in 1984 in New Jersey. He is a Member of the New Jersey Bar, U.S. District Court for the District of New Jersey and the United States Supreme Court. Prior to becoming a partner in the law firm of Cory and Hurley Law Group, Richard was in private practice concentrating in the areas of general litigation, contracts and real estate law. He served as Prosecutor or Public Defender in many municipalities in New Jersey from 1989 to 2003. He serves as a Mediator and an Arbitrator for FINRA (the Regulatory Body for the SEC). Hey Dave - Nice job. I watched streaming for a while.